I have had chronic back and hip pain since the ‘80s. I have tried everything for relief. I have been to chiropractors and all kinds of doctors. Even 5 back surgeries (with rods, screws and even a spine fusion) didn’t fix me and narcotic pain pills did nothing to relieve my pain. Although my physicians meant well and really tried to help me, it seemed like nothing was working. I hurt all the time. 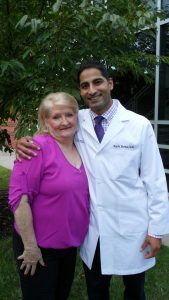 I was referred to Dr. Raj Sureja by my PCP. After seeing Dr. Sureja a few times, he suggested a Spinal Cord Stimulator be implanted to relieve my pain. I was in no way ready to have another surgery. I asked a physician that I trusted, for his opinion. He told me that wouldn’t recommend the Spinal Cord Stimulator. So decided against having it implanted and continued taking my pain medicine, hoping for relief. To make matters worse, in 2011, I was driving one day and a drunk driver hit my car head-on. My pain level went from bad to absolutely terrible. My pain just kept getting worse and worse. I was desperate for any pain relief. I again saw Dr. Sureja and he brought up the Spinal Cord Stimulator. I was very reluctant, but I hurt so bad that I thought it couldn’t make things any worse. Dr. Sureja told me that I could even try the Spinal Cord Stimulator for a week, without having it permanently implanted, so see if it helped me. I tried it and it did help with my pain. I decided to have it permanently implanted in 2013. All of my pain did not immediately go away. I still took pain medication after getting the SCS and the vibration sometimes bothered me. But, I decided to stick with it. One day, I called the Pharmacy to refill my pain medication. After hanging up the phone and thinking about it, I decided that I was done with the pain medicine. It really made me groggy and sleepy. I felt like I was missing out on the important things in life. So, I called the pharmacy and cancelled my order. I stopped my medication cold turkey and I haven’t taken any since. All I take now is Tylenol. Thankfully, I was able to talk to the person who adjusts the Spinal Cord Stimulator about the vibration I felt and how it bothered me. He was able to adjust it so that I barely feel the vibration anymore, if at all. I am happy to report that the only time I hurt is when the unit battery is low and needs to be recharged. I just tape the battery charger to my back when I go to sleep and then it is recharged when I wake up. What a relief! I once said that I just wanted to be able to go to the mall with my grandkids, and walk around without pain. I didn’t want much, just that. I can now do that and much more. I am so grateful to Dr. Sureja for recommending this technology. Life is now great!